Our Tesco » Latest News » Tayto Crisps Sandwich Kits in Store Now! 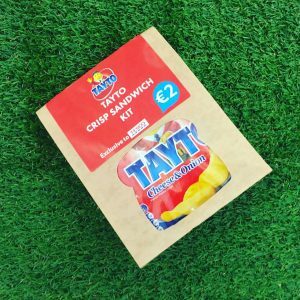 Tayto Crisps Sandwich Kits in Store Now! We’re kicking off the Paddy’s day food parade with a classic crisp sambo. Our new Tayto crisp sandwich kit launches in stores today! With two slices of buttered white bread and a pack of cheese and onion crisps, this kit is the perfect St. Patrick’s Day snack to enjoy while you’re out and about this weekend. Pick up yours for just €2 in all Tesco Stores this weekend!